The school has a well-established rugby team which is affiliated to the Vuka League and has strong ties with Rangers Rugby Club in Manenberg. Faheem Davids was chosen in 2011 to represent the Manenberg zone in the Gazelle squad which is the representative team of the Vuka League. The Vuka League is privately sponsored by ex-Springbok rugby players. The school has a very successful Steelband and Marimba band project. Learners find it both enriching and very entertaining to be part of the projects. The Bands are often invited to play at schools and corporate functions. The schools is also in the process of starting a jazz band. Watch this space! Trumpet and Saxophone classes have been started at the school. Students from the University of Cape Town provided tuition on a Wednesday at the school. The school gives practical implementation to its vision of ‘holistic development of our learners’ through an array of extra-curricular programmes and activities. Learners are required to participate in at least one programme or activity. 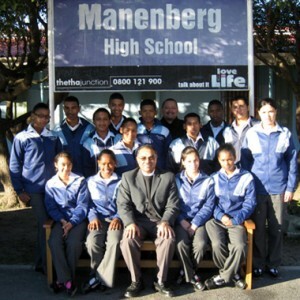 Manenberg High School’s Fitness Club was started in 2010. Physical training or better known as PT does not at present form part of the schools curriculum. The club was established by one of our teachers, Mr Dexter Hanekom, a fitness enthusiast himself, and also a supporter of the holistic development of an individual. He felt that this void had to be filled, thus establishing the club. The Club has 20 learners who look forward to every Wednesday when his classroom is converted into a “gym”. The major lack of resources is compensated by the learners’ enthusiasm. Click here to view map to school. Copyright © 2019 Manenberg High School. All rights reserved.